Student council is collecting grooming items (deodorant, shampoo, conditioner, toothbrushes, toothpaste, floss, soap etc.) for the homeless shelter. They are also collecting dried goods and non-perishables for needy families. Please deliver donations to the front office. 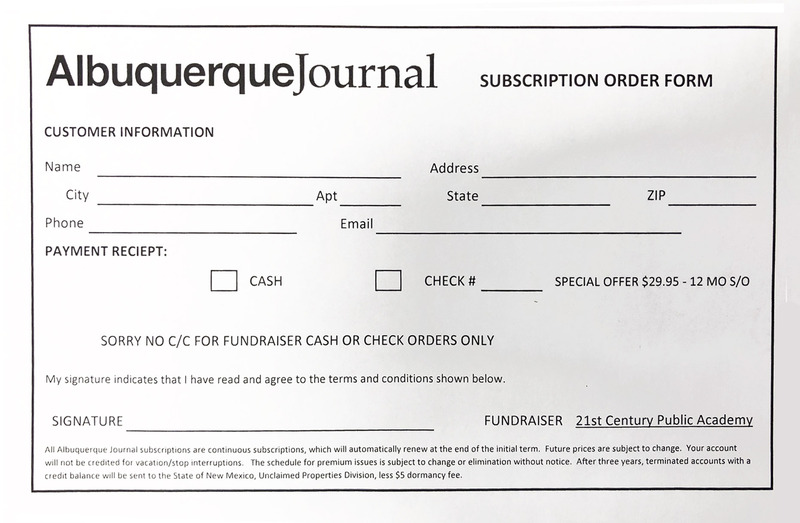 Order a 1-year ejournal with Sunday home delivery for $29.95 (make checks payable to Albuquerque Journal). 80% of profits go toward the 21st CPA Gym fund. Download the subscription order form here. Go to smile.amazon.com, log in as you normally would and select 21st Century Public Academy Foundation as your Charity. A small portion of every sale made this way goes to 21st CPA. Gift cards are wonderful gifts! Scrip fundraising is a no-selling program that allows families to raise money for their non-profit organization (NPO). Scrip is just another way to pay for everyday purchases using gift cards in place of cash, checks, and credit cards. When you use scrip gift cards at your favorite retailers, you’re fundraising while you shop. Great Lakes Scrip Center offers more than 700 of the country’s biggest retailers, including grocery, department stores, gas stations, restaurants, hotels, home improvement, and more. Just by using scrip to pay for your normal weekly purchases, you can easily raise $500 or more per year. It’s time to put your shopping dollars to work! Your 21st CPA Scrip coordinator is Denise Geoffrion, (505)263-7259, deniserrt613@gmail.com. Family Ordering Link: https://shop.shopwithscrip.com/Support/videos/family-ordering. On Saturday, December 8th, a percentage of all purchases made at the Barnes and Noble at Coronado Center go to the 21stCPA Foundation. On Friday, December 14th, let the PTA watch your kids for the evening! This event allows parents to drop off their children of all ages (potty trained only, please) so that they can shop, wrap presents, or just have a few hours without the kids. Meanwhile, the kids can enjoy spending time with other children playing games, watching movies, and doing crafts. Pizza will be sold for $2.00 a slice and drinks will be available for $1.00. Cost: $5.00 per child (with RSVP before December 11th), $8.00 per child without RSVP, additional cost for pizza and drinks.